You would think that a pirate’s booty had been discovered with a faded map. X marks the spot. You would think that all the gold doubloons in the world were meaningless compared to this treasure. The seeker goes around searching high and low. He knows where his treasure will be found. Quiet and stealthy he looks around. No one is looking. He sticks a small hand inside and unzips to find what he is looking for. Found it. Daddy comes in and sits beside him on the couch – the small hand resumes its quest. No place is sacred; nothing is off limits. Papaw is especially fertile ground for this little privateer. The unwitting are compliant and generous. Who can resist that precious little face as he looks up day after day and makes his request for – CHANGE! The bank is filling. The little screen on top shows the tally. There has been much fruit for this labor. Love this post. I can just see your little pirate looking for his treasure! Also, don't know how I haven't met you either! Yay for it finally happening! Seriously! So glad you came by. 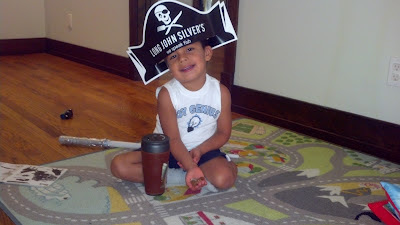 Love your little pirate and his daily treasure hunt. What a cutie pie. Thank you! We think he's pretty cute, too. Oh so adorable...I'm leaving here smiling wide. so blessed by you! it was fun hanging out last night --thanks for stopping in! Glad you came over, too. Glad you are smiling. Cuteness has garnered him quite a small fortune. Thanks for coming by. Thank you, glad you came for a visit. Cute!!! Love it and love your little treasure hunter! Thanks. The picture makes me want hush puppies- and a big ole hug. Too cute! Thanks for bringing a smile to my face today! Love this post! Well then, we need to make that happen and very soon!! Love this! He's adorable :) What a great memory to capture! I'm bad about picture taking, so I'm gald I've got this one "in the bank", so to speak. It was totally staged, but it still works. Wonderful new take on the word "change". I thought about that meaning too. But what a lovely game of treasure hunt. And such an adorable pirate. Very strange. So I will use my google account. Thank you for your kind comments & thanks so much for coming by and leaving your URL. Your work is beautiful. Thank you for stopping by my place. I love this idea. What a cutie!!! Thanks! I appreciate you stopping by as well.